I think as parents/adults who love to sew, many of us have an ongoing inner dialogue about which holidays “require” us to make new handmade garments for the kids in our lives. Halloween and Christmas are big ones, of course, but what about Valentine’s Day, St. Patrick’s Day, or…The Fourth of July? 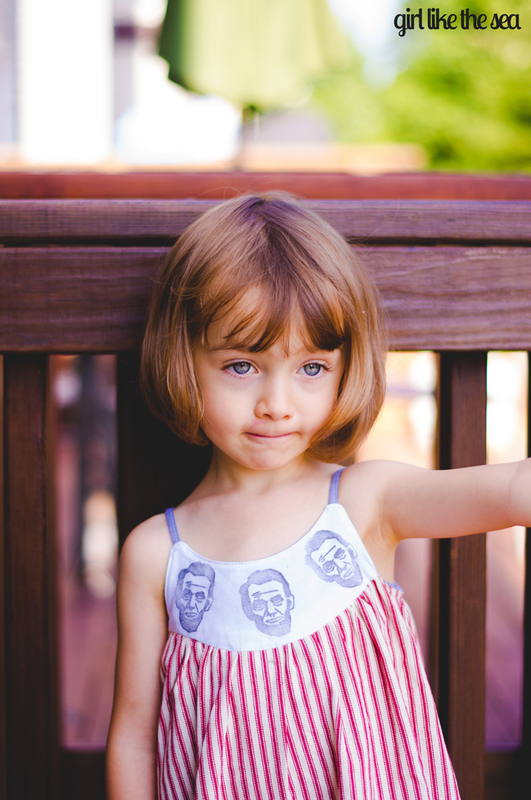 Tara from Girl Like the Sea decided her kids needed Red, White, and Blue Independence Day duds, so she sewed up a Swingset Tunic (lengthened to a dress), then went above and beyond with a hand-carved Abe Lincoln stamp! Such an adorable, quirky-festive look (love that ticking stripe skirt). Visit Girl Like the Sea for more photos of this fun dress, including a close up of that Honest Abe stamp and her most perfect button selection. I saw this version in Tara’s blog!